Dharampur is a town located in Solan district of Himachal Pradesh. It is about 65 km from Shimla and 15 km from Kasauli on the National Highway no. 22. It is also connected by Kalka Shimla Railway Line. It houses the first T.B. Sanatorium in North India. C .R.P.F camp on N.H 22 on shimla road. Dharampur sitauted on the Chandigarh - Shimla Highway. It is also connected to Kalka through toy train. 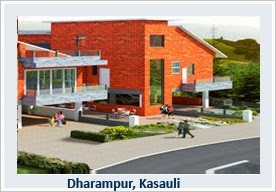 Dharampur also has a branch of Canara Bank which is a Premier Nationalized Bank. The Branch is situated at Subathu Road.The town is also well known to have one of the best hospitals in India for the cure of tuberculosis.